An increasing number of Singaporeans are seeking out investment opportunities just across the causeway. The Malaysian Ringgit is fluctuating in favour of the strong Singapore dollar, the increasing cost of property in Singapore, and ambitious infrastructure projects are some of the factors behind this trend. According to Knight Frank Malaysia Sdn Bhd’s managing director Sarkunan Subramaniam, Iskandar is a prime area for Singaporeans to buy high-end residential properties. The Malaysian government has certainly made it enticing, with many ambitious plans such as accelerating developments within Iskandar, specifically in five flagship areas including Johor Bahru City and Nusajaya. Also, for Singaporeans looking to retire in Malaysia, the Malaysian government has also introduced a “Malaysia My Second Home Programme”, which grants foreigners who fulfil certain prerequisites to stay in Malaysia on a multiple-entry social visit pass. Even South-East Asia’s richest man Robert Kuok, has bought land in Iskandar for a mixed residential and retail/commercial development project, a big shift from his previous plans to expand abroad in attempts to cut his exposure in Malaysia! But the looming question is, will Iskandar and other similar development projects rise up to the expectations that the Malaysian government has set in the minds of Singaporean investors? Negative precedent: It was reported in 2012 that some 129 disgruntled investors (which included some Singaporeans) took developer Karambunai Corp into arbitration over the arrears in payment on its “lease back” rental payments due on Nexus Residence, a luxury development in Sabah. One of the Singaporean investors, Deepak Gurnani, commented that “Malaysia is one place where I will never put money again”. Lack of transparency in Malaysia’s real estate market: According to the 2012 Global Real Estate Transparency Index, Malaysia ranked 23rd (ten spots below Singapore) in terms of ease of comparison of occupancy costs, ability to provide more options for strategic action, and efficiency of transactions,. This could present a huge risk to foreign investors who do not carry out enough research before making their investments. Unpredictability in the macro environment: Although the current government policies are in favour of foreign investors, there is no telling if or when the government and its policies will change. These impact the political stability and currency devaluation, which thereby affects property prices and the return on investments. Untested resale and rental market: With reference specific to the Iskandar developments, these projects are relatively new and there is no historical data to track the market development there. From a resale perspective, although some properties in Iskandar are currently sitting on healthy paper profits, whether sellers can find buyers for those units remain to be seen. Remember that new developments are aplenty in the area and is unlike the property market in Singapore where demand often exceeds supply. The situation is likely similar from a rental perspective. Having said that, these are risks that are associated with any property investment in any part of the world; basically, an investor’s return will only grow as much as the amount of risk he is willing to take. 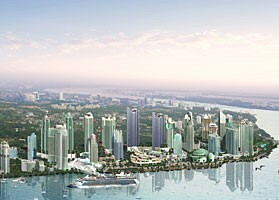 After all, it must be a positive signal when local companies are claiming a stake in Malaysia’s land developments too – earlier this year, CapitaLand Malaysia and Temasek Holdings announced that they will develop a $3.2 billion township with Iskandar Waterfront Holdings in Malaysia’s Danga Bay. At the end of the day, it all boils down to an investor doing his due diligence before plunging his money into any investment and his risk propensity. The rest, as they say, you just have to wait and see. mmh Iskandar has an excess of unbuilt land. Why would anyone buy on the secondary market when there’s plenty of attractive options straight from the developer? Unless buying with a very long term outlook, I’d rather invest in KL’s golden triangle which has a scarcity of available land.